Go ahead and enjoy the delicious treat of tangy BBQ sauce and still eat healthy. 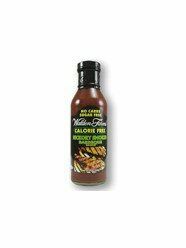 Switch from sugary BBQ sauce that can easily add hundreds of calories and treat yourself to Walden Farms Calorie Free BBQ Sauces. No calories, fat, carbs, gluten or sugars of any kind. Made with minced tomatoes, apple cider, Dijon mustard, Worchester sauce, cayenne pepper, dozens of freshly ground herbs and spices and the finest imported and domestic aged vinegars. INGREDIENTS: Triple flitered purified water, tomatoes, apple cider vinegar, dijon mustard, white distilled vinegar, vegetable fiber, salt, chopped onion, minced garlic, worcestershire sauce, xanthan gum, natural flavor, hickory smoked flavor, cayenne pepper, red cabbage coloring, sucralose, potassium sorbate (to preserve freshness).